You must make reservations at least 5 minutes in advance of the time at Soco Kitchen + Bar. SOCO Kitchen + Bar, our signature restaurant which brings in simple, fresh and delicious food with an innovative twist. 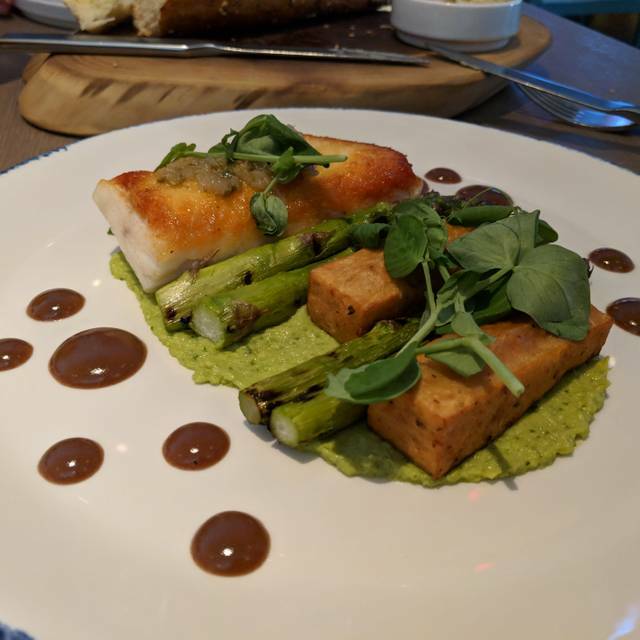 Join us in the heart of downtown Toronto, steps from the CN Tower, Roger’s Centre, Scotiabank Arena and Ripley’s Aquarium for our unique spin on simple, fresh and delicious food. Relax during the summer on our patio and enjoy the vibrant and warm ambience of the restaurant during colder months. Breakfast, lunch, dinner, or just for snacks and drinks, we’d love to welcome you anytime! SOCO To Go makes life easy as you can grab and take your coffee, tea and so much more! Good service, but a loud environment with underwhelming food. Service was great. Our waitress was very attentive to our needs. Food was good. Thank you to Jamilla and Meredith for both being amazing and for providing us with EXCELLENT customer service. We will definitely be back again soon! I ordered a veggie burger which was absolutely tasteless. It was so unseasoned I did not even have salt, forget about other seasonings! It was also very crumbly and had to be eaten with a fork and knife. I would not order that meal again. the fries compensated for an otherwise worthless meal. What a great find! Was really just looking for something close to our hotel, but ended up being a great meal. Was a very pleasant dining environment with great food and drinks. Just a tad pricey, but expected that for the great location. The restaurant was fine however I thought I would mention a very potent fish smell across the entire room. Now, don't get me wrong, I like fish, and I actually had some for dinner, however it's not a pleasant way to walk into the room. So maybe some ventilation issue? Service is a bit slow but I had many food restrictions and was able to find something. The food was dry, and for the price I paid, I expected much more.....I wasn't able to really request much from the waiter, as he was absent for most of the time. Never was asked how everything was by him, nor was my wife or I brought any water....nor asked if we wanted any. 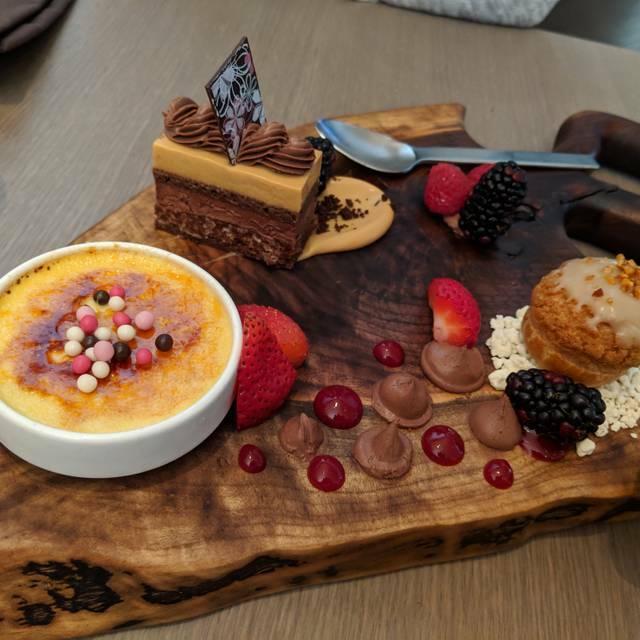 By the time he presented himself to ask if we were done, the meal was gone, and when I stated that the meal was dry as a bone, I did get an "I'm sorry"..........extremely disappointed by the lack of service, and the meal, but I will admit, the deserts are awesome. I had put in the reservations that it was my wife's birthday......never mentioned. Overall, for a 186.00 bill, I wont do it again. First visit to SoCo. Was pleasantly surprised by how good the food was. Gnocchi was delicious. Steak was fantastic. However, charcuterie board was quite skimpy and incredibly overpriced at $27. Excellent service, great location, good for business meetings (not too loud). Fish was a bit too dry, but otherwise great experience. My go to spot for sure! Too loud for business meetings. Food relatively poor quality (Duck confit and salmon dishes). Roast chicken looked good. One of the four of us ordered a salad with chicken and no chicken included. Service friendly, and apologetic. Plats succulents ( saumon avec petits légumes , shortribs purée-carottes fumées) , finement cuisinés et bien présentés. Good food and quick service, which is what we needed before the Leafs game. Ordered the charcuterie board for $27! Figured it would have some nice cheese. Basically got 3 hard fairly tasteless cheese in a tiny portion. Meat looked like lunch meat from the store and there was a very odd reddish pate. Inexplicably ketchup was one of the side dips. Very disappointing particularly at that price. Needed to eat fast and catch the Leaf game. This place was WAY too loud. The acoustic is terrible. We literally had to continually ask each other to repeat what was being said. Usually enjoy the food here but it was NOT good this time around. Pizzas were dry, tasteless- comparable to frozen pizzas. Not good! My colleague and I were attending a Leaf game and SOCO is really close to the arena. The food and service was good and as expected it filled up pretty quick with the pre-event crowd. Waiter slow with water service. Love this restaurant. Actually fined here two nights in a row since we like it so much the first time. My only wish is that some of the portions were bigger. IE. octopus or bass dishes. Food was average but pricey. My wife ordered a $38 steak that wasn’t worth $20. Burger was average at best. Over cooked and dry. Mac and cheese was worth it. The ambiance is ok, it’s clean inside but the lights are a little bright and the decor feels cold. Our server was great, she helped us choose a drink and asked us the right questions when ordering. She was always there when we needed her. 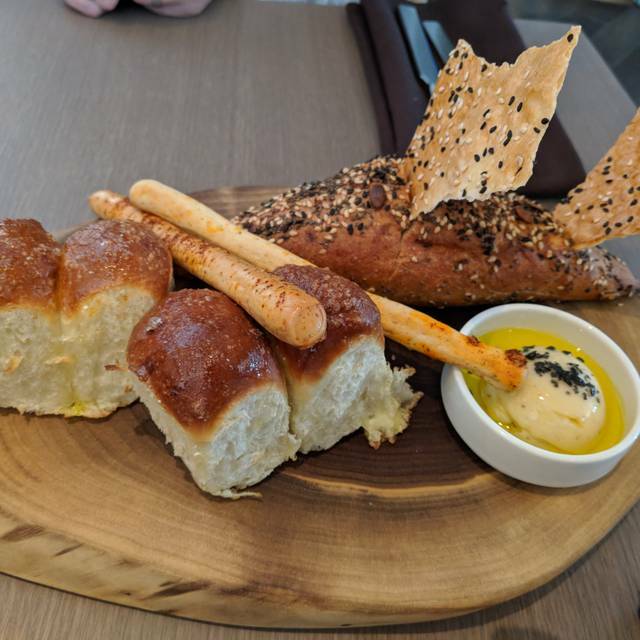 The food was wonderful , we got the steak tartar and the charcuterie and cheese platter to start with an Order of bread it was lovely. We liked the sesame crackers it went well with the charcoal goat cheese. The other cheeses were amazing though we didn’t find out what they were. The girl who dropped them off didn’t tell us. For our mains we got the duck and th bass, both were fantastic. 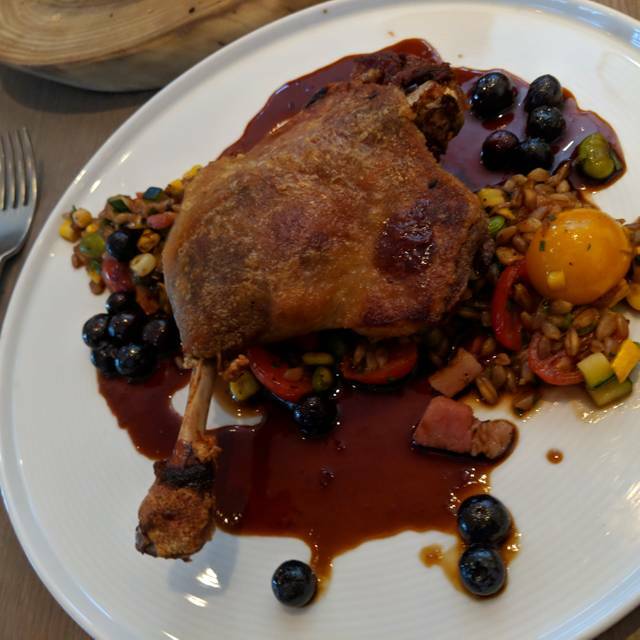 The confit was super flavorful. The bass was perfectly cooked and tender, not at all bland. Excellent food and service. Packed and busy. Lots of reflective surfaces, so pretty loud. Not easy to hear each other. Had a great experience, my only issue was portion size. I felt like the portions were a little small. Other than that everything was delicious!! Food was pretty good, but service was pretty bad. Our server, Steve (sorry to call you out, but...), only came over twice: to take our orders and to bring the cheque. We sat there for about 45 min with empty water and wine glasses before I decided to go to the host stand to ask for the bill. The hostesses were very sweet (too bad you only interact with them for 30 seconds!) and informed the server that we’d asked for the bill. He came back maybe 10 minutes later with it. Have had good service here in the past so hopefully this was a one time thing, but I’m not sure that I’ll go back anytime soon. Good ambience in the place overall. My experience was great. I was there for lunch yesterday and the food so I returned today. Good service; price is fair in downtown area. Like the view; can see the street. Pizza and tuna poke were great. Disappointed in the size of the octopus sausage appetizer. Great experience. Reasonable value, considering the location. Steps from Scotiabank Arena. I've been a customer many times. This last visit had me finding it more difficult to choose a dish off the main dinner menu. There was nothing that was jumping off the page wanting me to order. I applaud the chef attempting to vary the menu and making it more 'edgy' but I also recommend some additional comfort food options such as a seafood pasta or a slow cooked beef. I came close to order the Halibut but when its that busy, you hope that it won't be delivered cold or over cooked. I played it safe with the meatballs along with the heirloom tomato salad. They were both excellent. Otherwise its a perfect place to go before a Leaf or Raptor game given the proximity to the Scotia Centre arena. Great place to enjoy the downtown area on the food and drinks.